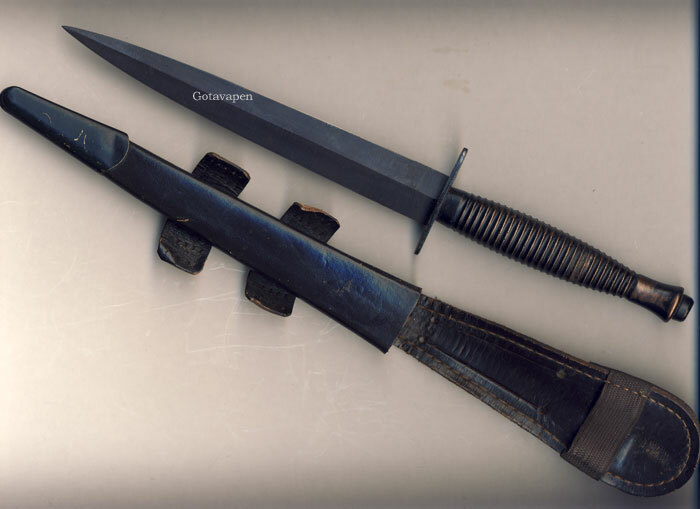 F-S Fighting knife and Commando Knife post war production. Olof Janson unless otherwise stated. Who have given me much assistance. were made after WW2, between 1945 and 1952. 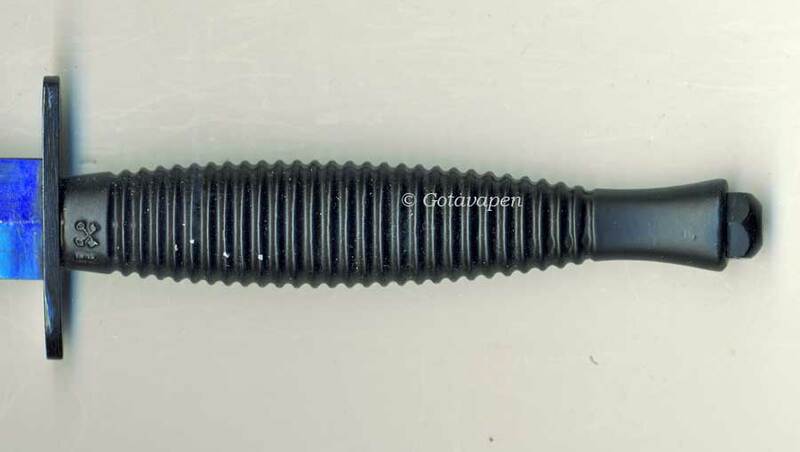 1948 WSC started to offer nickel plated and all black Pattern 3 for commercial sale. Some knives were also offered as presentation to serving soldiers from Norway, Holland and UK. 3rd Pattern all black Commando knife. 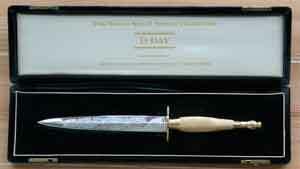 This is a late wartime knife of the Masonic Etch type made during the war and in still stock still at Pall Mall in 1945. It was sold (private sale) after the war end probably 1945/1947. You can tell as the 'Made in England' etch has been put on AFTER the logo etch. You can see this because it is not centre and slopes a bit yet the logo is straight and true. This was done after 1945 because of regulations about country of manufacture being marked on good, especially importing to US. Wilkinsons started marking heir goods (razors) in the 1920's to conform to US requirements and started putting Made in England on FS Knives in 1945 for non contract/Government Order knives sold to US personal or shipped to the States. Wilkinson Sword Company standard 3rd Pattern white Commando knife. Commando knives for Commercial purpose & display. 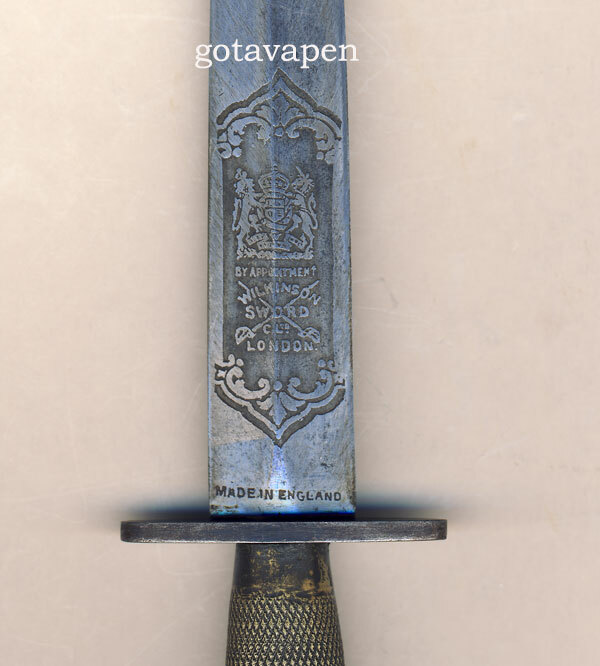 "HAND FORGED BY TOM BEASLEY THE FAMOUS SWORD SMITH"
According to Robert Wilkinson Latham Wilkinson Sword Company made 500 special “Commando” knives were made for window and showroom display. 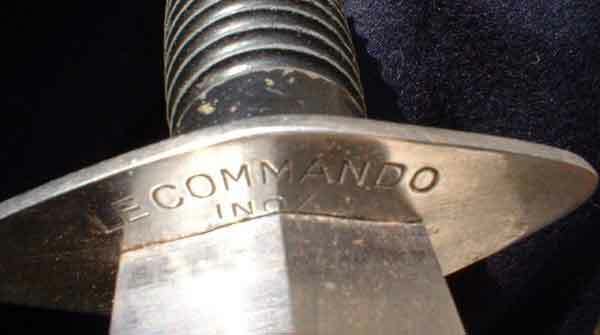 Wilkinson had dropped the FS for their post war knives as the initials meant little and Commando was an evocative name! Despite popular belief these knives were never meant as presentation gifts. The presentation gifts were standard production knives and scabbards. 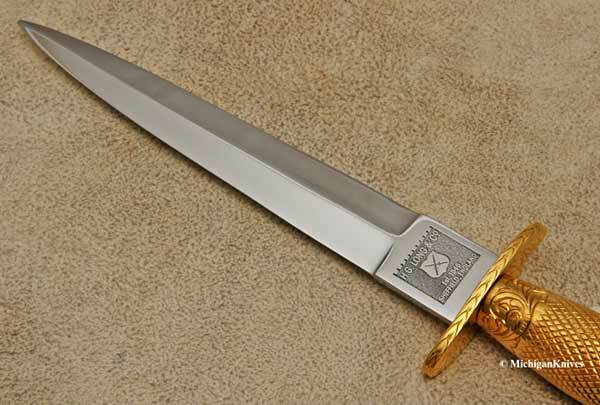 The blade was etched on one side with “Commando Fighting Knife World 1939-1945” in a shield with below it near the cross guard the Wilkinson Sword trade mark. The grip was made of smooth “ivorine” which is a nicer word for ivory imitation, made from plastic. The cross guard was standard type as well as the blade. The scabbard was made of black leather with gold or nickel plated mounts. Tom Beasley joined Wilkinsons on 8th May 1884 and spent the rest of his life with the company forging blades for swords and knives. His special skill was forging blades. He was very famous sword smith. He forged the blade of The Stalingrad Sword in 1943. It this sword Jack Wilkinson holds in his hands on the picture. 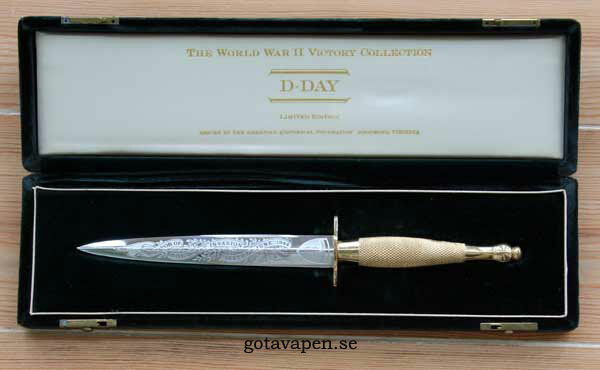 This sword was presented by King George VI to Josef Stalin in honour of the Russian troop’s defence of Stalingrad. Tom Beasley died in 1950, 90 years old. 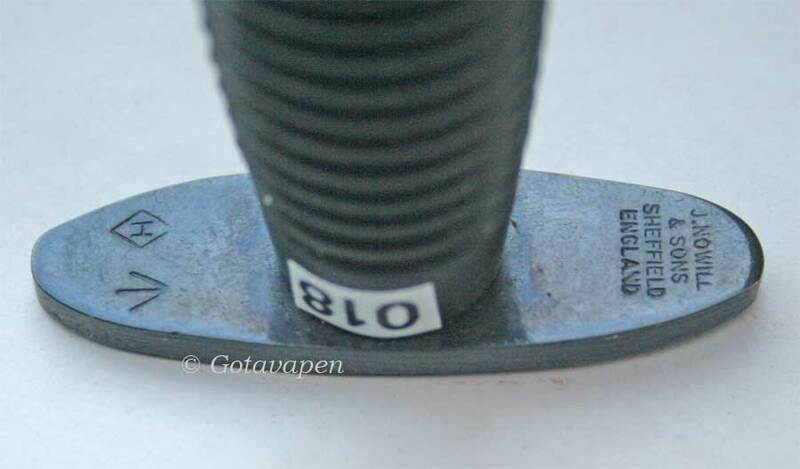 These blades were most likely not forged by Tom Beasley, although this was written on the blades. After his blade forging of the Stalingrad sword, he offered mental and inspiring support for the wartime work force. 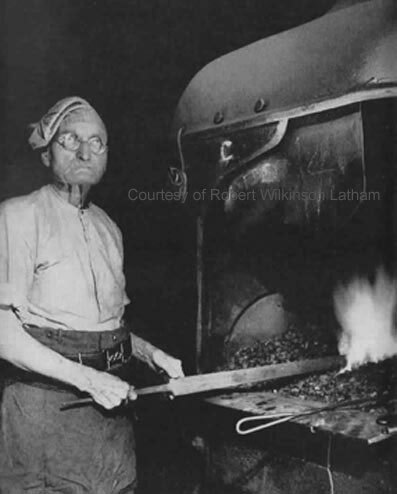 Robert Wilkinson-Latham told me that 500 knives were made like this one. They were intended for display windows and exhibitions. These knives were sent to qualified dealers. 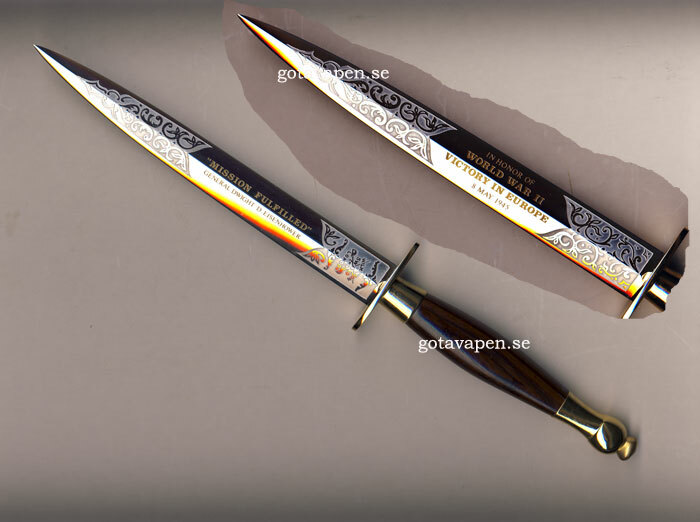 I remember such a knife and similar sword at an exhibition in Gothenburg many years ago. After the war Wilkinsons received an order in 1964 from the Admiralty. These knives are marked on the underside of the cross guard with ‘FR693’ and the scabbards were marked with ‘FR271’. These knives were standard production all black knives. According to Robert Wilkinson Latham who was Manager for the company at that time Wilkinsons in Pall Mall at the time says that it was about 100 knives. There are also reports of some knives of both WW2 2nd and 3rd Pattern marked this way. These knives came complete with their boxes from the MoD store. According to Ron Flook a small number of FR693 original knives have appeared now complete with boxes. This is a B2 marked, BSA produced knife from 1944-45 but also marked FR693. 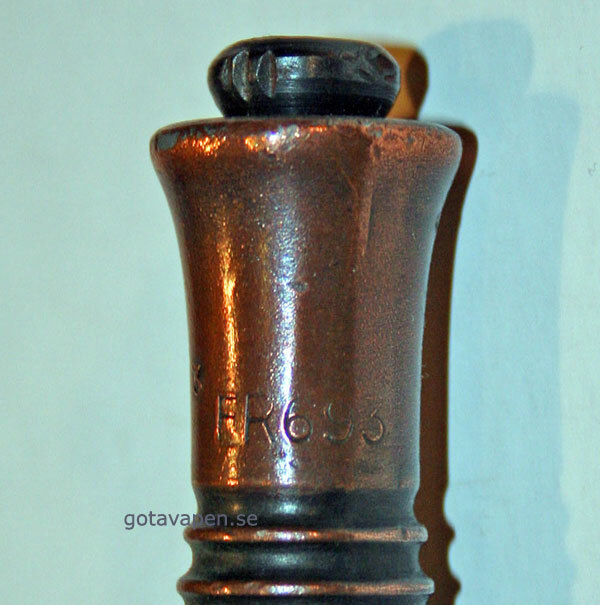 Note the pommel nut is typical for Wilkinson and BSA. The FR693 was an ADMIRALTY NUMBER. 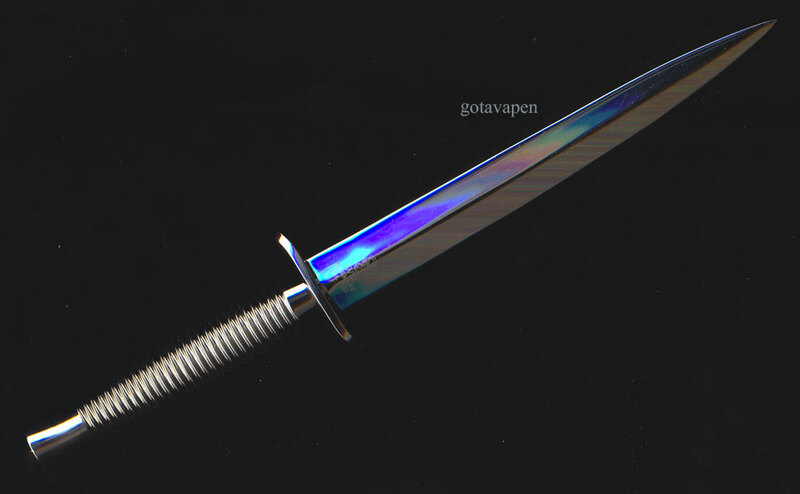 FR693-knife. Note the pommel nut of large dome type. Note the stamp on the pommel and the scabbard! In 1964 Wilkinsons filled an order from the Admiralty. 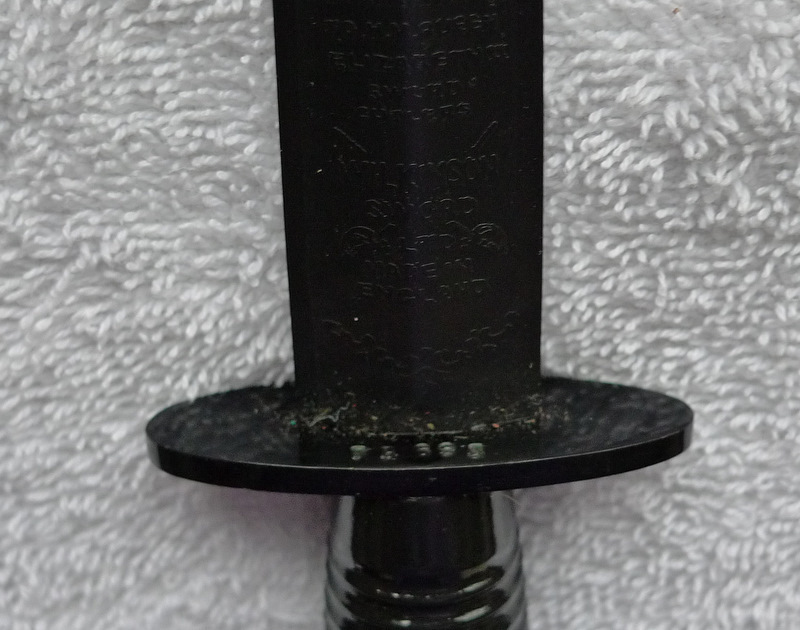 FR693 marked on the cross guard and made by Wilkinson sword Ltd. In the 1990's Wilkinsons were owned by a company called Warner Lambert. 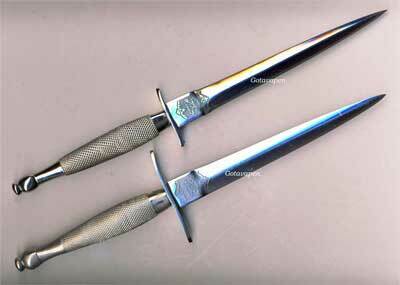 The new owners were persuaded by believing collectors of the existence of a 3 inches cross-guard knife in 1940. They were drawn into what might be a myth. They started to produce a new 1st Pattern knife with a 3” cross-guard without any research in their own files and documents or even asking people who could have known. Robert Wilkinson Latham opposed against it. He pointed out that there were no proofs or solid facts that such a knife ever had existed, but they didn’t care. By producing this knife they established that such a knife really had existed for sure! 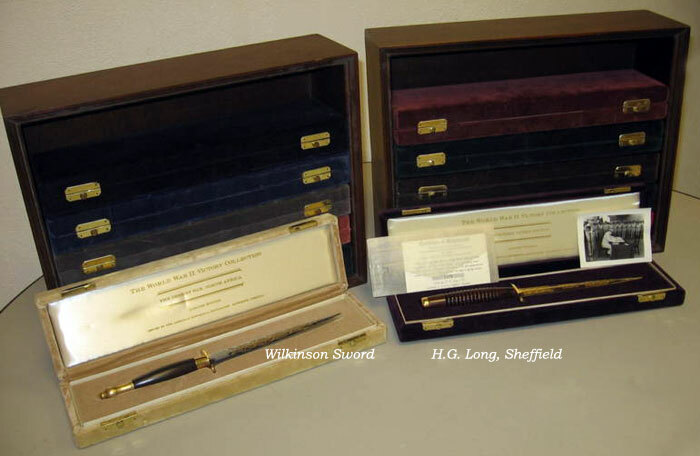 In the end of 1980's, Wilkinson Sword Company (WSC) issued a commemorative FS 1st Pattern knife with 2 or 3 inches S-shaped cross guard and FS logo etching similar to those made 1940-41. It was not intended to fool any expert collector. 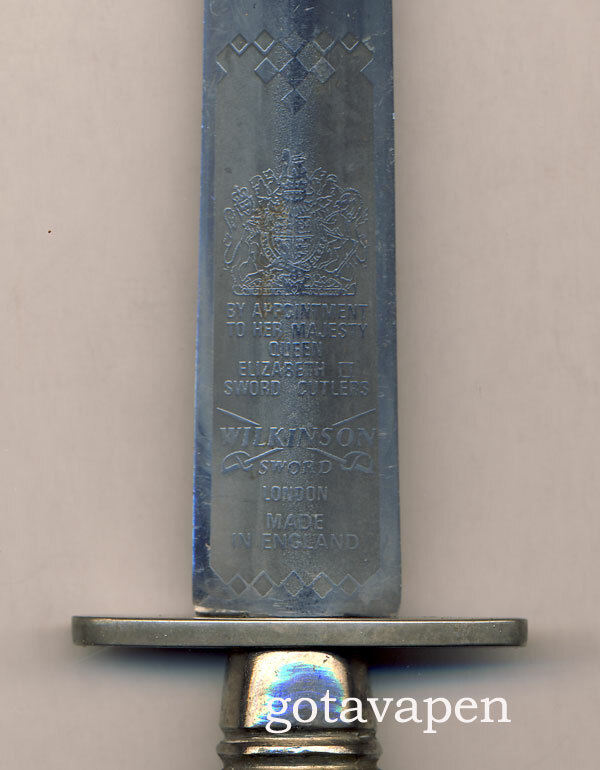 The blade etching was modernised and Wilkinson Sword Company did not use the original plates for the etching. The cross guard was too thin and the pommel was too ball shaped, however the blade was superb. 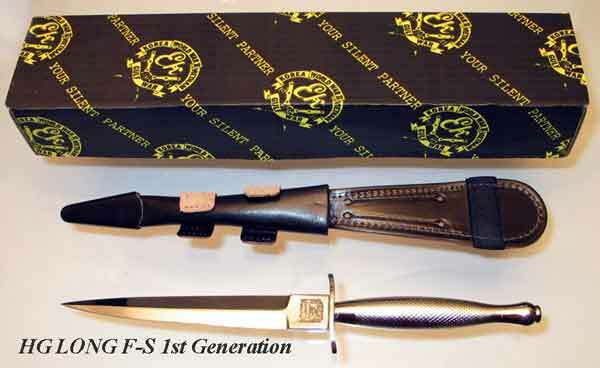 These 1st Pattern F-S knives are the only WSC Commando knives with the F-S logotype etching from their post war production. These recently produced knives can not be called copies, because they are made by the same original company to the original specifications, but they can easily be differentiated from the even more beautiful knives produced in the beginning of WW2. 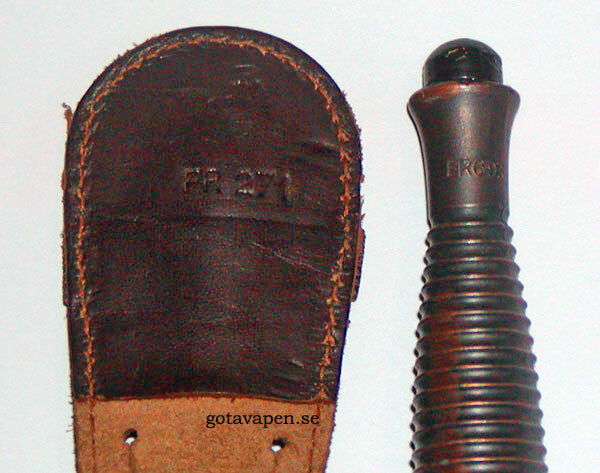 To the left a WW2 1st Pattern F-S knife 1940-41 and to the right a 1st Pattern knife from 1990. 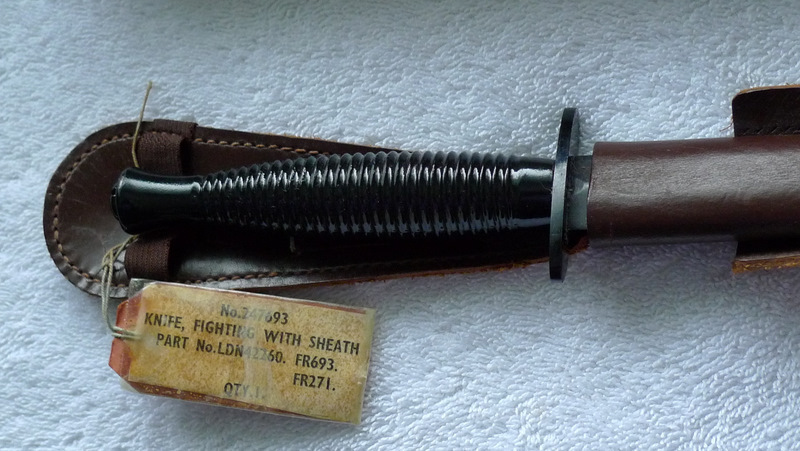 This is another post war F-S Fighting knife of the very 1st Pattern with 2 inches cross-guard. This knife was made 1990. Wilkinson Sword Company Commando knife without F-S markings. Notice the typical shape of the blade from Wilkinson Sword. Various commemorative Fighting knives were made by WSC in the last 40 years. The knives are suitably etched, adorned and presented in a case. None of the these Commemorative knives incorporated the original F-S etched logo except some special orders of very limited series for special occasions. Wilkinson Sword made some Commando Commemorative knives. The following WW2 Victory collection was made for the American Historical Foundation when Robert Buerlein was president. American Historical Foundation ordered another collection for about the War in Pacific made by H G Long, Sheffield. H.G. Long - War in Pacific. New WSC Logotype with the accession of Queen Elizabeth II. This logotype was used for both nickel plated and black Commando knives until 1996 with minor graphic variations of the edges of the etchings. Logo above and to the right is screen printed but also done in wax transfer. The old way at the same time. Next Logotype for WSC - Laser Etching 2002. 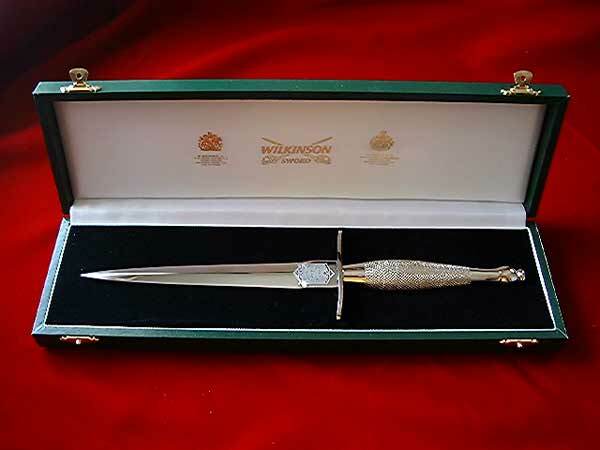 Wilkinson Sword Co. produced these beautiful knives until September 2005, when they ceased with the production of swords and knives. Weyersberg, Kirschbaum & Co (WKC) purchased in November 2005 the tools for the production. See WKC futher down in the text. 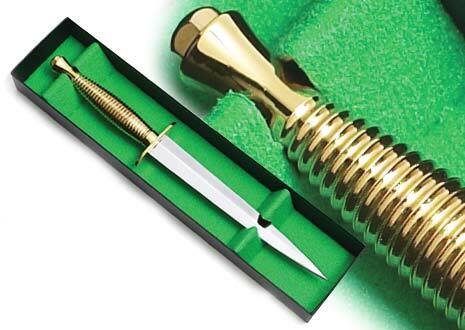 Pooley Sword follow nowadays the tradition in of producing high quality F-S. In 2001 Robert Poley of Pooley’s Flight Equipment Ltd had brought the idea forward to the Army Air Corps to supply the pilots of the Apache helicopters with a rescue knife based on Wilkinsons Commando knife. They asked for a FS knife, but with a very short, approx 2-3” blade. That had a black grip and crosspiece, 3rd Pattern style, and a ground blade dipped in acid. 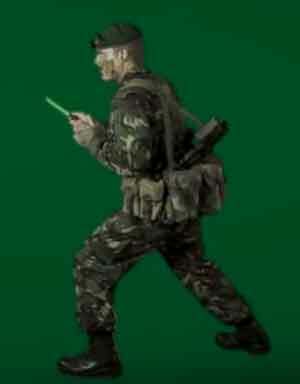 The knife could also be used after as a survival/fighting/general escape and evasion knife. Rodgers submitted one finished but NOT blacked, Wilkinsons subittedtwo all black samples to AAC Training. When WSC ceased to manufacture swords and knives in 2005, the idea to make such knives was brought back by Pooley in 2008 and new samples were made. Pooley Sword Ltd made six knives. Three were destroyed and three were returned when the project was rejected in Sept. 2008. Army Air Corps Helicopter Escape knife (HEK) made by Pooley Sword Ltd (one of three existing). John Nowill & son still produce Commando knives. Nowadays the company is owned by J. Adams Ltd, Sheffield. All knives produced by J. Adams Ltd are 3rd Pattern Commando knives. They are either all black or polished and plated. The scabbards are normally far to big for the knives. The cross-guard of John Nowill & Son. Typical for this knife is its markings. 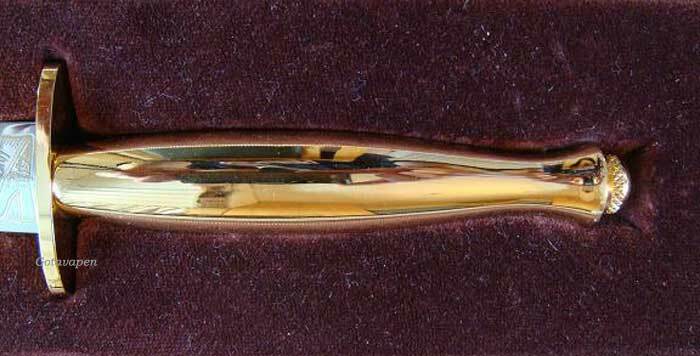 The acceptance broad arrow is placed on the cross-guard. 'H' inside a rectangle is the trademark for F.E & J.R.Hopkinson Ltd, established 14 June 1944, which was incorparated by J. Adams Ltd. I have visited the company in Sheffield. The broad arrow is stamped by the company itself on the cross guard. 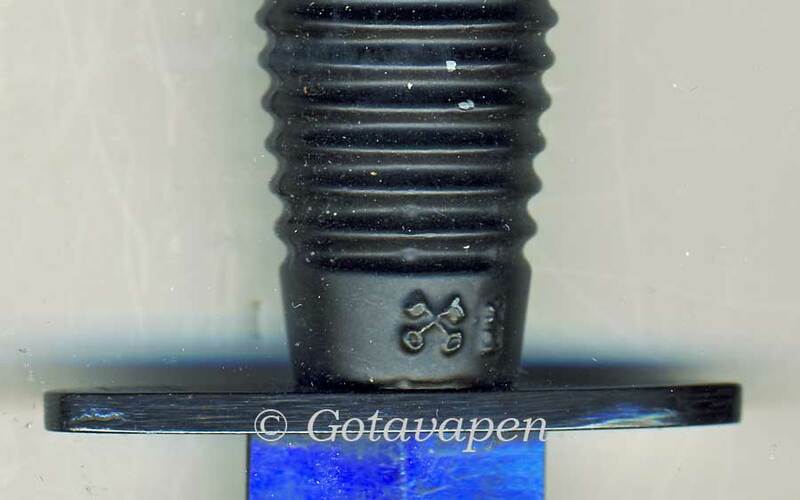 The hilt is a 3rd Pattern,ring type and has two crossed keys close to the cross-guard. The trade mark ‘Crossed Keys’ was acquired by John Nowill & Son 1842. The Pommel nut is hexagonal. Note the hexagonal pommel nut. 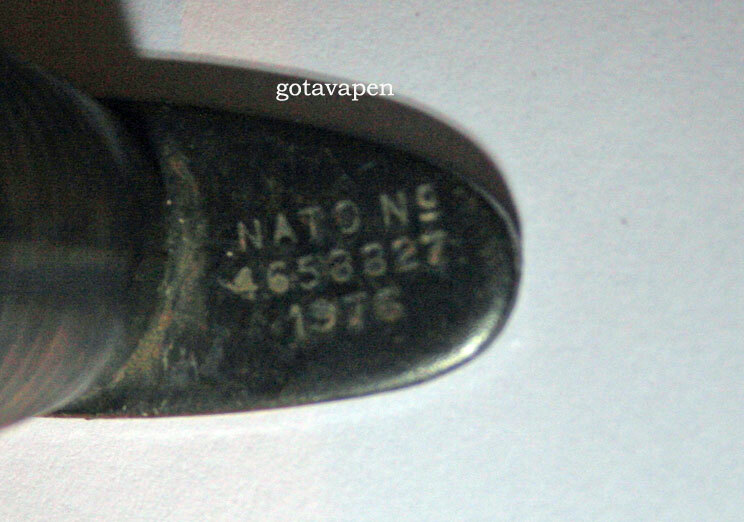 Commando Knives according to NATO specifications. Wilkinson Sword marked the blades with their post war logotype. 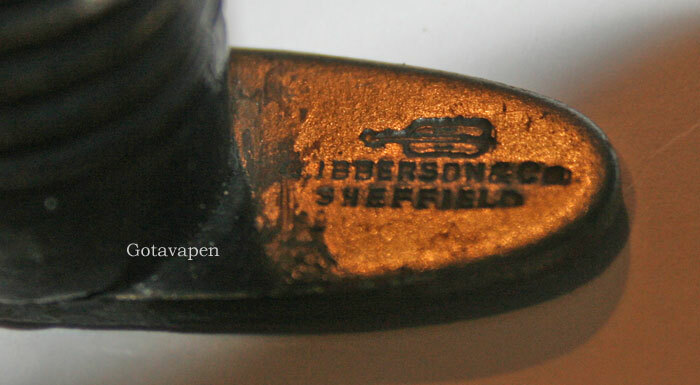 George Ibberson knives are normally marked both with NATO and the Violin and Ibberson, Sheffield. 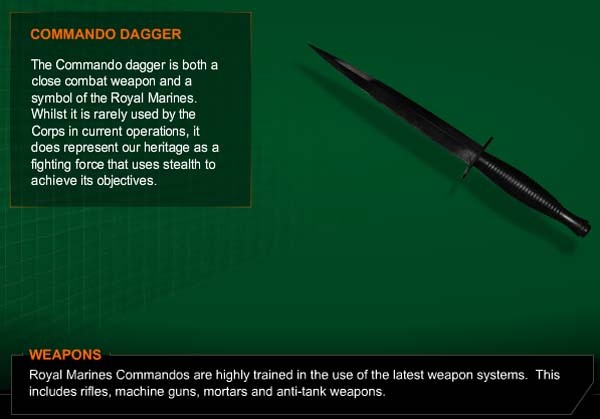 Royal Marine Commandos have used the commando knife Since their creation in 1942 until today. It can be found on their website as one of their weapons. H.G. Long made different knives from 1846 to early 1990s. They have made many very beautiful specimens. 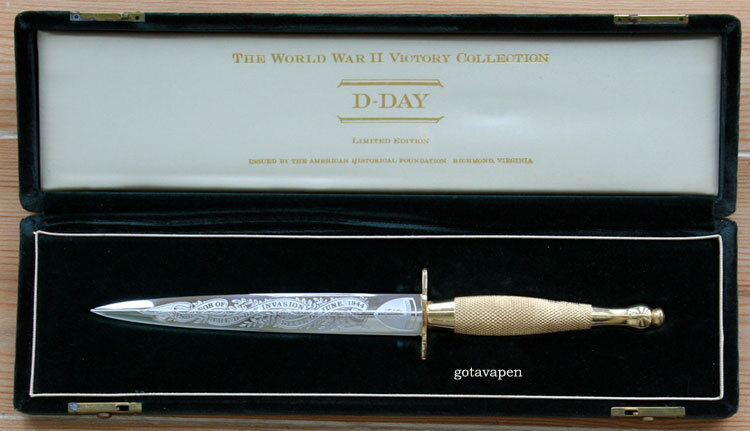 They made many commemorative knives after the war for the American Historical Foundation. The knife pictured was made by EK in Richmond and sold to the Blackjack Knife Co. in 1993. Blackjack sold the EK stock in Blackjack boxes, but the knife was not made in Effingham. and the H.G. Long logotype on the other side. The blades of these knives have a different shape than WSC. 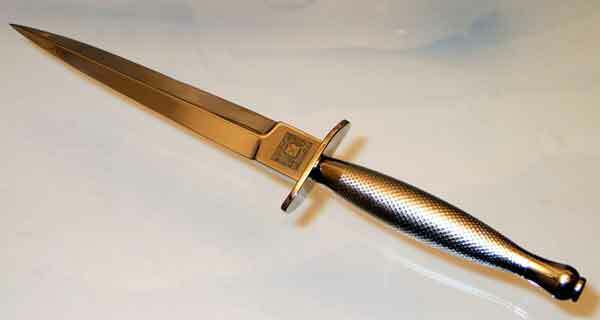 WKC is nowadays offering a Commando knife with a 3rd type ringed grip, their own type of blade (similar to 3rd Pattern), slotted pommel nut and a wavy cross guard like the WSC 1st Pattern Knives. 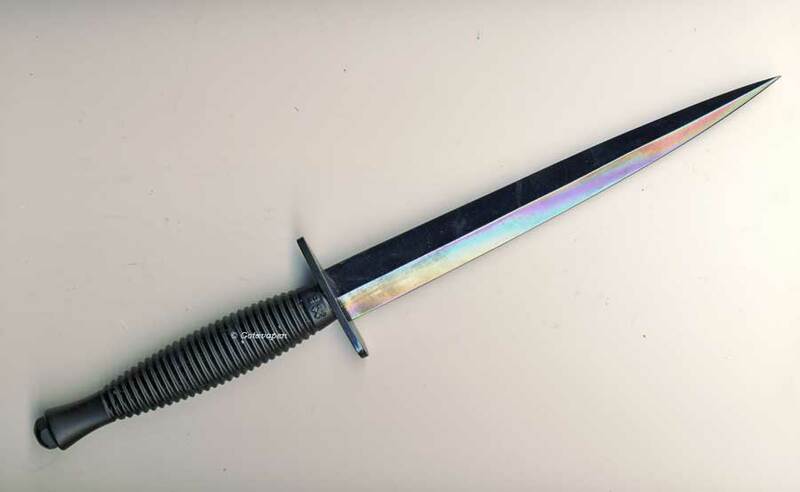 Commando knife for the French Legion. 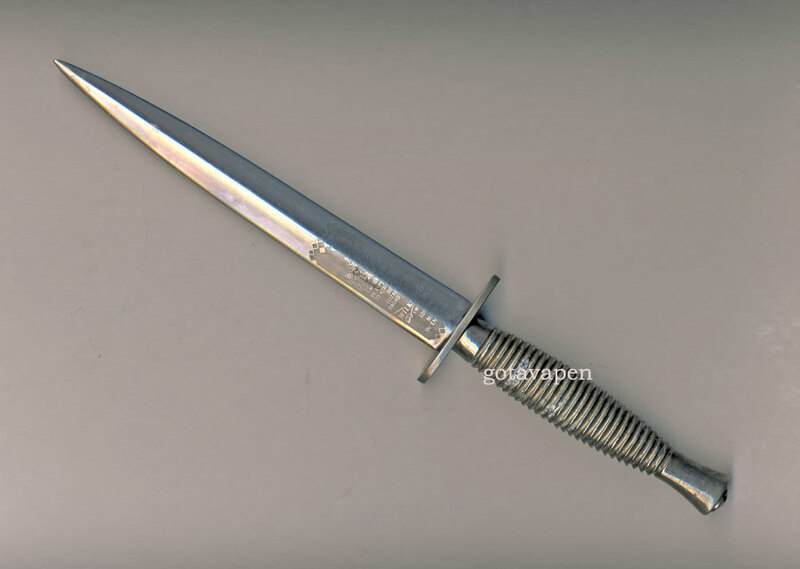 French post-war Commando knife made for commercial sale and used by the French Green Berets. Note scabbard with clip. This knife is shorter than Pattern 3. There are also plenty of cheap copies of the Commando knives; most of them are produced in the Far East with inferior quality and finish. There are some ruthless people who sell new British WW2 Commando Daggers and claim that these knives belong to the genuine FR693 lot. Be aware! This knife is NOT a collector’s item! 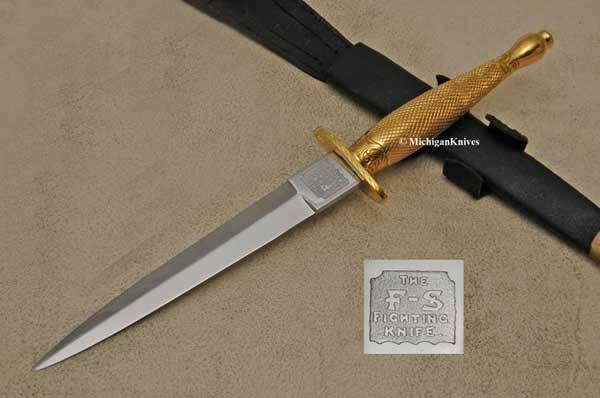 There are three basic modells of the F-S fighting knife. 2nd Pattern F-S Fighting w/o Wilkinson trademark. 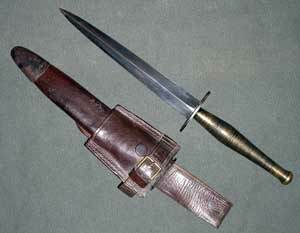 The Stalingrad Sword made by Wilkinson Sword. Ron Flook British and Commonwealth military knives. Frank Trzaska The O.S.S. Stiletto - Knife World February 1998. Kelly Yeaton The First Commando Knives. Dr. William Windrum The earliest commando knivesAllan W. Locken – Commando 1940 - 1945.